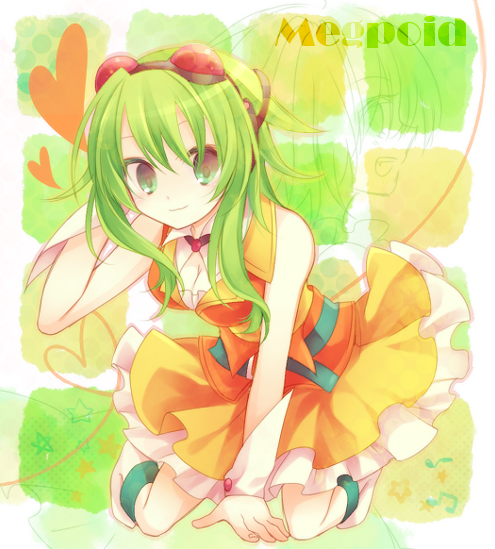 Appearance:(Face Claim - GUMI - Vocaloid) Leaf is 5’11” (1.8 meters) and weighs around 123 lbs (55.79 KG). She is normally seen wearing a bright green tanktop, along with a pair of shorts. She has green hair and eyes, although it is rumored that her hair is actually a natural blonde. She has a fairly ample bust, and is often the object of many a man’s desires. During Pokemon Contests and concerts this changes to the outfit shown in the picture. History: A Hearthome City native, Leaf was surrounded by Pokemon contests as a child, and as such became completely fascinated with them. Her parents worked at the Contest Hall there in the city, which further supported her fascination. By the time she was 7 she had risen as a prodigy in the world of Pokemon Contests, and was on her way to winning her tenth consecutive Contest before being recruited by a recording company who had heard her sing shortly before the contest started. A couple years later Leaf had amassed quite the fanbase, and her face could be seen anywhere in Sinnoh. That was when her parents decided to have a change of pace, and moved the young star to Lesion. Her sizable following moved with her, and within a few days she was once again gathering fans in the Lesion region. By her 12th birthday, she had become the youngest Coordinator to ever win the Lesion Supreme Pokemon Contest. A year later and she was once again performing in various towns and cities throughout the region. A few days before her fifteenth birthday, Leaf confessed to her parents that she wanted to try her hand at the League Challenge, due to it being her original dream before she started into Contests. After some persuasion her parents finally caved, and permitted Leaf to head into Seasalt Town on her 15th birthday. While she was successful in reaching Seasalt Town, she was delayed in the start of her journey for a year due to a relative in Johto falling ill, and she now returns to start where she left off. Personality: Leaf is a very cheerful person, and always tends to look at the bright side of things, even if the bright side is obscure and hard to find. She is extremely friendly, and loves making friends. Despite her astounding fame as both a singer and a Lesion Supreme Pokemon Contest winner, she never seems to lose stride in her beliefs. She loves her Pokemon equally, and even though she is starting on the Pokemon League Challenge she has never forgotten the Pokemon she left at home. She sometimes finds the constant attention given to her annoying, but is grateful for the year spent in Johto as it allowed her to fade a bit into the background. Seems all well and good now! Approved and Moved!